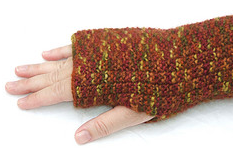 These fingerless gloves are knit in a square shape and then seamed up one side, leaving a hole for the thumb. The pattern is suitable for beginners and the gloves are a medium adult size. I discovered this stitch by accident several years ago when I cast on the wrong number of stitches for a two-by-two rib. I'm sure it has a name, but I haven't been able to find it. It's a reversible stitch that creates a stretchy fabric and looks best when knit with small needles. *K2, P2*, repeat from *. Continue this repeat until the piece is 2.5 inches long. K1*P2,K2* to last stitch, K1. Repeat until the entire piece is 9 inches long. Use mattress stitch to seam the side starting with the wider edge where you cast on. Leave a 1.5 inch gap in the seam for the thumb approximately 2 inches from the top (the narrower edge where you did the bind off). Make a second one using the same pattern. Here is an example of the fingerless glove using the same pattern and needle size, but with alpaca yarn. Please feel free to contact me with any questions about this pattern. In all seriousness, it might be called "Mistake Rib". I'll have to check it out. Great job! I've been trying to get my knitting club members to make these. My daughter made one but never finished the 2nd...sigh. Love your new couch!!! I rec'd the ATC you made and it's great. I'm mailing mine on Monday. Very pretty angel from Dogwood! Love the gloves... I can't knit a stitch:) no not one, but I sure would like to try! Have a blessed day and weekend! Thanks for the pattern Stacy -- they're so pretty. And soon to be so needed too LOL! they look great Stacy, I might have to bookmark this for when it gets cooler. This is the first pattern for fingerless gloves that i think i can do!!.......Thanks!! I'd say "Mistake Rib" is right. I've done this on some scarves I've made. Love the gloves and the texture. Thanks for sharing the pattern. Can you knit fingerless gloves using only the Knit Stitch or do you have to know how to purl stitch? Can you give me some sizes for an 11 year old kid? Re: "Mistake Rib's" daughter making only one glove. Been there.....done that. After fussing with myself (which didn't make the other glove for me), I am NOW making them two at a time!!! They're the SAME size....and when I'm finished.....I'M FINISHED!!!!! I'm making this pair for our mailman. They can't wear full finger gloves to sort the mail....but their hands get cold.